Medicinal mineral waters for relaxation. There are multiple positive effects on the body. Bathing in these waters can be relaxing, act as an anti-inflammatory, analgesic, antiseptic, heal wounds. 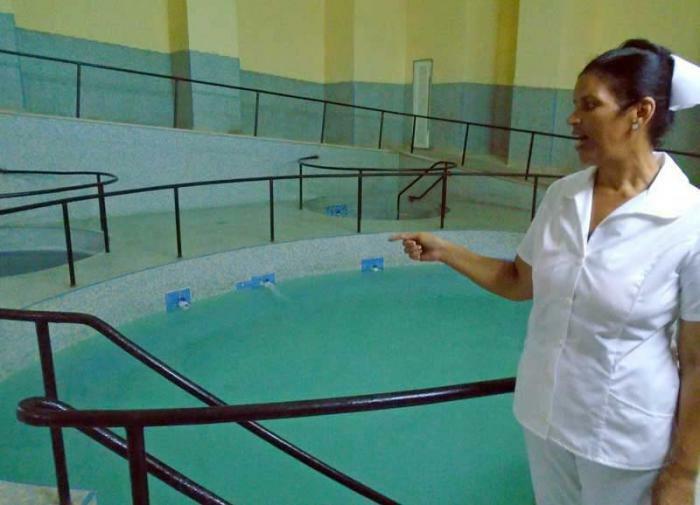 The San Diego de Los Baños Thermal Baths Resort has welcomed patients from across the country and various nations of the Americas and Europe. Photo: Ronald Suárez Rivas. Pinar del Río.- For centuries medicinal mineral waters have been sought out to cure diseases or relieve pain. There are even those who claim that this is one of the oldest forms of treatment. But why are they thought to be good for one’s health? In the case of San Diego, these natural springs oscillate between 36 and 38 degrees all year round, and the waters contain sulphur, sulphates, calcium, sodium, chlorine, magnesium, and fluoride, the specialist notes, although he clarifies that the number of elements may vary at different sites. In ancient times, people had already noticed the medicinal effects of certain waters. Hence there is no shortage of references to their healing properties throughout mythology. According to historians, some 450 years BC, some of the earliest principles of the practice of bathing in medicinal waters were set out by Herodotus, while Hippocrates also referred to the virtues and potential side effects of their use, a little later. Since then, the use of medicinal waters has seen moments of glory and also of rejection, until arriving at a stage of growing interest today, in which the question of the effects of these thermal mineral waters on people again arises. Dr. Dagoberto explains, “Sulphur, for example, is absorbed through all channels: the skin, mucous membranes, breathing, and once incorporated, it spreads through the body. “The same happens with other chemical elements, with very important effects on the body, and whose presence in these waters allows them to reach the body without undergoing any alteration,” he adds. “Absorption through the skin is much faster and better,” he says, noting that even when these same substances are concentrated in the form of a tablet, the effect is never the same through the digestive route as that achieved through bathing. There are multiple positive effects on the body. Bathing in these waters can be relaxing, act as an anti-inflammatory, analgesic, antiseptic, heal wounds. “In the past, before the existence of certain medicines, one of the most frequent applications of sulphurated thermal waters was as an antiseptic, to cure wounds or certain types of infection,” explains the San Diego Baths director. This marks the difference with other facilities that have proliferated in recent times, such as commercial spas. “Although they may appear to be the same, there is one fundamental aspect that distinguishes them: the nature of the waters. While spas use common water, baths are classified as health centers, using natural spring water with medicinal mineral properties,” Dagoberto stresses. This is the case, for example, of patients with psoriasis or dermatitis, and also people who have suffered the effects of cerebrovascular diseases, such as cerebral infarctions or ischemia, which result in temporary limitations. 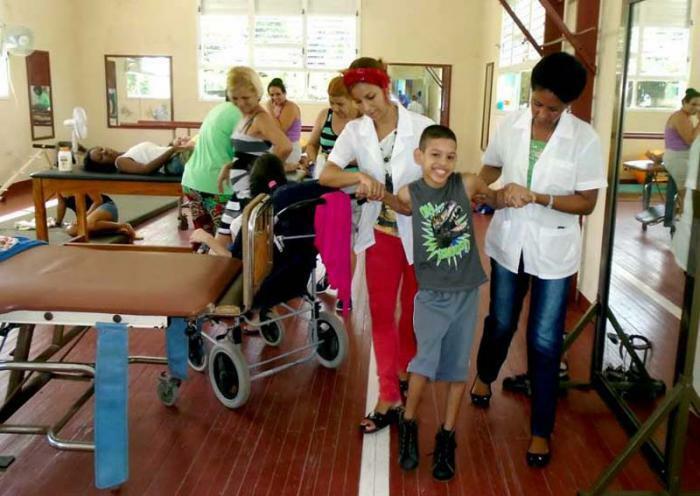 Given these benefits, the specialist believes that the current marked increase in life expectancy in the country provides a scenario in which the use of medicinal mineral waters is of great importance for the treatment of aging-associated diseases, ensuring not only a longer, but a healthier life for Cubans. He clarifies, however, that bathing in these waters is not only beneficial for those with a health problem, as it is also a relaxing experience. In addition, the waters have analgesic properties and can help reduce the appearance of degenerative processes of the body, such as arthritis, and in general increase quality of life. Human beings arrived at such a conclusion thousands of years ago, but in the absence of the means to carry out further studies, when faced with the indisputable evidence of magical waters, capable of healing wounds and relieving pains, they attributed these benefits to supernatural forces.